HMS Belfast was in the news this week; I was very relieved to here there were no serious injuries arising from the walkway failure and hope it reopens soon. But it reminded me of my first visit there with the cub scouts in about 1983, and how different the area around it was then. 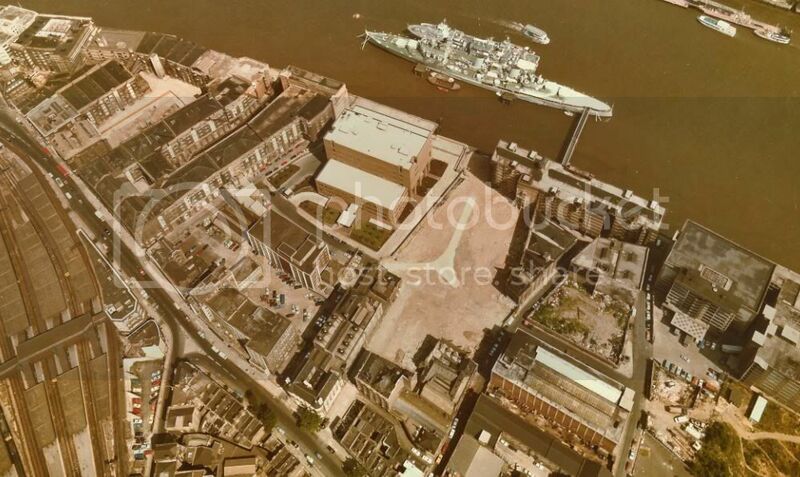 Luckily, I have a photo of HMS Belfast and its surroundings from above in 1983 (click for larger version). HMS Belfast obviously occupies the same spot in the Thames, and the brown building adjacent to it is Southwark Crown Court, still much the same. However, much else in the vicinity has changed since. To the left of Southwark Crown Court are a series of warehouses around a narrow dock; this was Hay’s Wharf. In the 1980s the dock itself was converted to an underground car park, with the warehouses renovated, the centre section roofed over and Hay’s Galleria was born. Much of the rest of the area has since been redeveloped, with More London wrapping new buildings around the court, and just to the right lies City Hall, home of the GLA and Mayor of London. Some buildings along Tooley Street have been retained, if only the frontage in some cases, and Tooley Street itself is somewhat smarter, and now carries two-way. The image below shows the area today (click for larger version) from Bing.